Wave Ocean is the first stage in Sonic the Hedgehog (2006) for the Xbox 360 and PlayStation 3. As with other levels in the game, it features in all three of Sonic, Shadow, and Silver's stories, although the characters fight their way through the area at different times and for different reasons. Part of the coastline of the city-state of Soleanna, Wave Ocean neatly fulfils the Tropical Island Cliche for Sonic '06. Palm trees, sandy beaches, and loop-de-loop seastacks border a picturesque azure ocean, replete with jumping dolphins (and slightly less placid orcas). Unusually for a Tropical Island Cliche level, the area is clearly developed as a seaside tourist resort; Soleannean marinas and lighthouses rise up from the ocean, while deckchairs and parasols can be found on the sands. The area is geographically adjacent to Dusty Desert, Sonic's second level. Mission: Pursue the Egg Carrier! After Princess Elise's kidnap during the Festival of the Sun, Sonic and Tails eventually locate Eggman's Egg Carrier towards the northwest of Soleanna Castle Town: in Wave Ocean. Naturally, the heroic duo set off in pursuit. 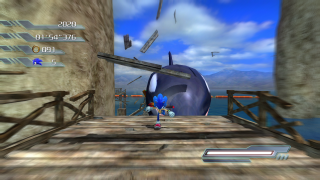 Sonic's first section sees him aquaplaning across the water in several sections, and ends with an orca smashing up the piers he's running across, a la Emerald Coast from Sonic Adventure. With the hedgehog stuck holding on to the whale's dorsal fin for dear life, Tails has to find a switch to lower the marina's door and prevent the creature from taking Sonic on a fatal trip out to sea. Thusly rescued, Sonic spots the Egg Carrier in the sky, and races after it in the game's first mach speed segment. Wave Ocean is the only level to occur twice in one story; the above for Sonic with Tails, and then again as a later, solo mission for Tails on his own. Following Sonic's Tropical Jungle stage, Eggman remembers that he has a large, heavily armed floating battleship under his control, and hits upon a more sensible way of recapturing Elise: simply threaten to slag Soleanna to blackened glass unless the Princess surrenders herself. Tails runs into Elise's lady-in-waiting in Castle Town, who begs the fox to go rescue her mistress. Tails runs through much of the same terrain he did in the level's previous iteration. His efforts are, alas, essentially entirely futile, as Elise is shown back on board the Egg Carrier in the next cutscene. The fox then meets back up with Sonic in Castle Town, explaining that they should head over to Kingdom Valley next, as that's probably where the fat man has taken the princess. Silver himself never actually enters Wave Ocean through all of Sonic '06. In Silver's Story, the level is played exclusively by Blaze the Cat. Mission: Head to Soleanna Castle Town! After Crisis City, Mephiles the Dark teleports Silver and Blaze into the past in order to assassinate the Iblis Trigger. Either by accident or design, the time-travelling separates Silver from his frankly more competent ally, depositing the hedgehog in Tropical Jungle and Blaze on top of a particularly massive seastack in Wave Ocean. The cat's mission is simply to get out of the area and find Silver. The task is not made easier by the presence of Eggman's robots, presumably still milling about in the area after Sonic and Tails' earlier run through. The orca which so plagued Sonic has not calmed down, either; it's still swimming about destroying piers during Blaze's level, much to her consternation. Mission: Provide Backup for E-123 Omega! After his trip to the past with Silver to see the Solaris Project in Aquatic Base, Shadow drops back into the present (conveniently) right next to Rouge in Soleanna Castle Town. The bat informs him that Omega is pursuing Mephiles over in Wave Ocean; so the Ultimate Lifeform naturally speeds off to assist. Shadow's mission begins with a hang-gliding segment between the seamounts, firing rockets at the Iblis monsters presumably summoned to the area by Mephiles. The action then switches to E-123 Omega, who eventually catches up with Mephiles... only for the invisible demigod's ominous voice to declare that "it won't take me long to deal with you..." The player then switches back to controlling Shadow, who proceeds through a standard platforming section (plus eventual use of the buggy and hovercraft) to catch up and assist. In Shadow's "Very Hard" downloadable content mission, a motorbike section is also included in the level. In the subsequent cutscene, Omega in fact blasts Mephiles into smoke without requiring any backup at all; but not before the crystalline being forces Omega to admit that he is the one eventually responsible for capturing and imprisoning Shadow in the future.